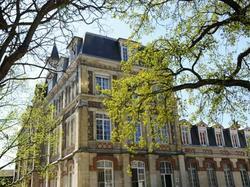 Maison de l'Abbaye is located in the centre of Antony, 15 km from both Versailles and the centre of Paris. It offers rooms with free Wi-Fi access and views of the surrounding park, and is run by a Christian community. Each room includes a flat-screen TV, a wardrobe and a private bathroom with a shower and free toiletries. Rooms can be accessed by a lift. A continental breakfast is available daily. You will also find a chapel on site, a shared kitchen area and a shared lounge area with a TV. Free, private parking is possible on site. Antony RER Train Station and the Orly Val Airport Shuttle is only a 2-minute walk away and provides direct access to central Paris and Orly Airport. Rungis, with its wholesale food market, is under a 10-minute drive away. The reception is closed on Saturdays and Sundays. Check-in is possible with the access code. This room includes a flat-screen TV and a private bathroom with a shower and free toiletries. It offers a view of the courtyard. This double or twin room is more spacious and includes a sofa bed, flat-screen TV and a private bathroom with a shower and free toiletries. It has a view of the park. This room includes a flat-screen TV and a private bathroom with a shower and free toiletries. It offers a view of the park.